Ashland, the heart of Chequamegon Bay! Where you’ll find yourself next to the water! Your destination for year-round recreation. Lake Superior in the summer means world-class smallmouth bass fishing in Chequamegon Bay as well as great near-shore and deep-water fishing. Warmer temperatures send many fish to deeper water where vertical jigging can produce walleye, northern pike and panfish. Discover the winter charm of Wisconsin’s northwoods with a visit to Ashland and the Chequamegon Bay area when ice and snow transform the vast wooded terrain into a pristine landscape of quiet beauty. Ashland County’s more than 200 miles of well-kept trails are a snowmobiler’s paradise. Many area hotels and motels offer easy access to the trail system, some even allowing visitors to snowmobile right from their door onto major trails. For a free Ashland County snowmobile map, call 1-800-284-9484, or click here to view the trail map online as a PDF. Winter brings anglers out in droves for ice fishing on Chequamegon Bay where they can take their pick of excellent fishing for walleye, northern pike, or any of the three major panfish – perch, bluegill and crappie. Sometime after Christmas, Lake Superior usually freezes and anglers can fish for all the aforementioned species as well as all varieties of trout. In late January, the ice usually extends into the Apostle Islands where die hard lake trout “bobbers” practice vertical jigging in water up to 250 feet deep for fish that regularly exceed 20 pounds. Cross-country skiing and snowshoeing are also popular cold-weather pastimes in the Ashland area and offer a great way to take in the area’s natural beauty at a slower pace. For the most up-to-date ski trail conditions, click here. Exciting winter events and activities such as the Book Across the Bay ski/snowshoe race, held on the frozen surface of Lake Superior, attract thousands of visitors to Ashland each year. As you browse our many gift, clothing, sporting and specialty shops, you’ll find everything from local delicacies and gourmet delights, to outdoor gear, vintage clothing and fine art. Searching for that perfect gift for someone special? You’ll discover so many intriguing possibilities as you stroll through Ashland’s historic Main Street district. Known as the “Historic Mural Capital of Wisconsin,” Ashland’s pride in its rich history is evident in its 17 vibrant murals highlighting a particular aspect of the city’s colorful past, depicting subjects ranging from the city’s lumberjacks and military veterans to its railroads, storefronts and former massive ore dock. Ashland offers visitors a wide variety of mouthwatering mealtime choices. Check out one of our locally-owned eateries for home-cooked specialties or sip an award-winning craft-brewed beer with your meal. Ashland, the heart and soul of Chequamegon Bay, encourages visitors to enjoy and explore all that Lake Superior country has to offer. Click here to download the 2019 Ashland County Activity & Visitor Guide or here to have a Visitor Guide mailed to you. Find yourself next to the water in Ashland! Ashland County’s more than 200 miles of well-kept trails are a snowmobiler’s paradise. Many area hotels and motels offer easy access to the trail system, some even allowing visitors to snowmobile right from their door onto major trails. Winter brings anglers out in droves for ice fishing on Chequamegon Bay where they can take their pick of excellent fishing for walleye, northern pike, or any of the three major panfish – perch, bluegill and crappie. Cross-country skiing and snowshoeing are also popular cold-weather pastimes in the Ashland area and offer a great way to take in the area’s natural beauty at a slower pace. For the most up-to-date ski trail conditions,click here. Ashland offers visitors a wide variety of mouthwatering mealtime choices. As you browse our many gift, clothing, sporting and specialty shops, you’ll find everything from local delicacies and gourmet delights, to outdoor gear, clothing and fine art. Known as the “Historic Mural Capital of Wisconsin,” Ashland’s pride in its rich history is evident in its 19 vibrant murals highlighting a particular aspect of the city’s colorful past, depicting subjects ranging from the city’s lumberjacks and military veterans to its railroads, storefronts and former massive ore dock. Ashland will warm your heart on the cold winter days!! We are the heart and soul of Chequamegon Bay. We encourages visitors to enjoy and explore all that Lake Superior country has to offer. Click here to download the 2019 Ashland County Activity & Visitor Guide or here to have a Visitor Guide mailed to you. 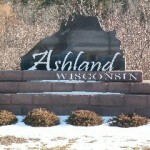 Find yourself next to the water in Ashland!Wondering what it would be like to visit Ashland, WI in the winter? Click here and find out!